Explore five surprising examples of why you need to try group travel on your next trip. The last thing people envision during trip planning is joining a group of strangers. Lounging in one-of-a-kind accommodations, tracking flight prices, scrolling through amazing cultural sights, never-before eaten foods, and climbing trails through unknown terrain… with people you’ve never met? 1. Join the pack! You’ll make new friends and lifelong connections. When you mix an international adventure with a curious group of people from all different backgrounds, you encounter unparalleled, valuable moments. 2. Expand your perspective and skills. Some travelers—like this writer and traveler Jen Han, love to plan their own adventures. From our well-traveled team to our international tour guides, you’ll experience a curated trip from a locals’ perspective. Plus you can have your own personal AMA: Ask Andrew Anything! Through our international community of farmers, chefs, and artisans, you can take a local’s deeper dive into global food, beverages, and crafts. Once you’re Coast to Costa family, you’ll never come back home the same! You don’t have to be shy when you want that travel photo of your dreams. From llama cameos on Machu Picchu to enjoying classic cocktails against beautiful architectural backdrops in Havana: never fear. You can stay present in the moment without regretting not capturing that perfect moment. 4. Enjoy the journey you want for a better price. It’s difficult to put a price on world travel, but more accessible travel makes unfeasible vacations possible. As Coast to Costa Founder, Andrew once put it, “People are able to experience a place in a way that is totally non-touristy, guided but also with free time to explore on their own. Plus, you meet great people along the way to share the experience with. Skip saving for the entire cost of an international trip. With group travel, your costs are divided so you can save that cash for handmade souvenirs, perfecting your Peruvian recipes at home, or your next trip! There’s never a dull moment when traveling with a group, but, remember, you can always choose-your-own-adventure at your own pace. As Antonella Pisani points out, there are plenty of great lifehacks if you’re introverted but want to try your hand at group travel. First, try to identify common interests or hobbies with the group. Meet talented photographers, writers, and travelers who have a wealth of knowledge. Nurture your inner creative and hone a new skill! Join us in Cuba in November during three photography walks led by Dan Tom: capture dusk on the Malecon, cityscapes, and architecture, and a nature excursion. Maybe arrive a day early, enjoy some occasional me-time with a good novel or noise-canceling headphones, find a new adventure buddy to wander off with, or even FaceTime or use WhatsApp to call a loved one when you need a break. This is your experience and we encourage you to make it your own! Personally, as an only child and a professional writer, I certainly need my space. I never considered group travel before my Coast to Costa-led trek through the charming vineyard-packed Valle de Guadalupe in Baja Mexico. When I look back, toasting our border crossing, sharing unveiled surprises, bonding over unreal bites and sips at dinner, and snapping one another’s photos together was the perfect introduction to an unknown world. There was something magical about standing in line for our decadent seafood lunch in Ensenada as an ensemble. Taste buds on edge, quietly strategizing what to order, practicing our Spanish—that was the catalyst for the entire trip’s camaraderie and shared wonder. Ready to add group travel to Cuba or Peru to your bucket list? Join us on one of our next trips coming up on October 23-30 and Nov 16-23, 2017. Intrepid vegans and vegetarians: it may be tough, but here’s how to do it. 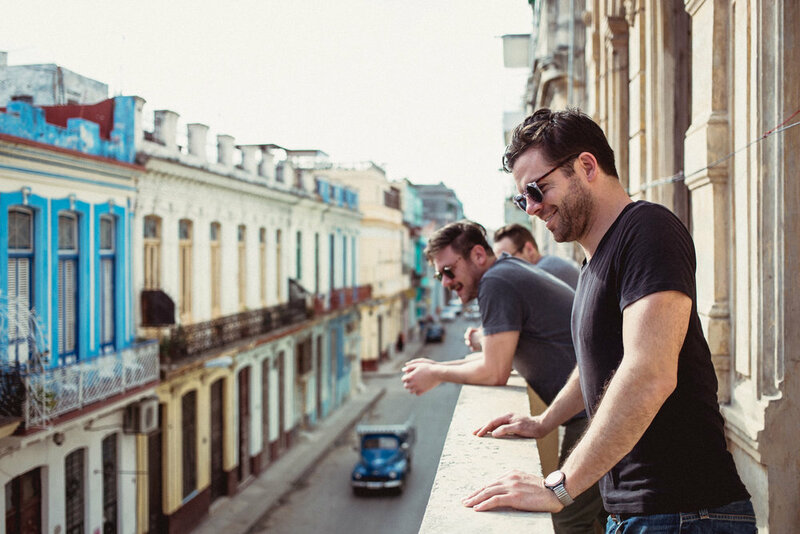 Savoring local rum, cigars, and vintage cars is surely on your checklist on your trip to Cuba. But how can you enjoy traveling like a local in the country whilst a vegetarian? Vegetarianism is still not the easiest feat in a country known for abuela’s chicken, roasted pork, classic crusty grilled cubano sandwiches, with a side of rice, beans, and plantains. Be sure to integrate “sin carne” and “sin jamón” into your Spanish vocabulary. An important phrase when sampling local delicacies sans meat or ham, especially since locals frequently categorize jamonada (Spam) as a non-meat option. Embrace rice, beans, eggs, plantains, salad, and pizza. Major staples will be include traditional rice and beans, eggs and omelettes, fried plantain, salads, and, yes, pizzas. Vegans, hit the paladares*. Vegans are pretty limited when it comes to local Cuban eats that fit their dietary preferences. A paladar, or in-home restaurants, offer guests an opportunity to simply order off-menu. Most spots have rice, black beans, and root vegetables -- potato and malanga--readily available. With the reopened American Embassy in Havana and tourists are changing the face of what it means to be a culinary entrepreneur in Cuba. When chefs were accustomed to only limited selections of ingredients just a few years back, now multiple options, like a new variety of fresh produce are available. Revitalized local green markets ( known as agromercados) are flourishing thanks to reorganized farming co-operatives. Without a wholesale market, however, products can vanish from Cuba’s government-run supermarkets without any notice whatsoever. So just as vegetarians must be resourceful when it comes to planning their trip to Cuba, chefs are equally creative when it comes to last-second menu substitutions. Last week, you may have heard the news about President Trump’s new travel restrictions in Cuba. We watched the press conference with anticipation and were brokenhearted to learn that travel to Cuba will be lessened. We want you to know, that our trips have always been aimed at supporting local families and businesses, and will continue to do so. We pledge that we will continue to bring groups of curious, like-minded travelers to Cuba in the hopes of creating more peace and understanding. Since we began bringing groups to Cuba over the last two and a half years, we have witnessed the positive changes that the influx of tourism has brought firsthand. We were fortunate to be in Havana the week that President Obama visited Cuba. What we witnessed was the hope and positivity of a new future for both Cubans and Americans. Good, hard working people were finally able to open their own businesses and begin to vastly improve their lives. In 2016 alone, non-Cuban American visitors to the island soared 74 percent thanks to return of commercial flights. Cuba’s 615,000 visitors from the US last year was a record, while still a fraction of the island's 4 million visitors. To us, the tightening of travel and commercial ties with Cuba feels like a step backwards. We want to let travelers better understand how the new policy will change travel going forward. In the regulations, travel is now restricted to people traveling with groups with OFAC licenses. We are fortunate enough to be one of those companies. You’ll need to know what exactly constitutes legal forms of travel to Cuba going forward. Should Americans want to visit Cuba for “educational purposes”, they can only do so in tour groups, just like before 2016. While under President Obama, U.S. travelers could travel under a dozen various license categories—from educational, relgious, journalistic, family-related visits, or even simply under a “general” license—tourism was still prohibited. President Trump is cutting out what are known as “people-to-people trips”. This is sub-category of “educational purposes” allowing U.S. citizens to tailor their own trips and travel to Cuba on their own—definitely one of the most popular methods with U.S. travelers since President Obama and President Raúl Castro of Cuba announced they would begin begin normalizing relations between the two countries back in 2014. Those visiting for educational reasons will now be required to apply with the Treasury Department and visit with a licensed tour group. Island visitors can continue to “self-certify” under a general license that they are traveling to Cuba for one of the reasons that are left. Also, Cuban-Americans should know they can continue to visit and send money to their family in Cuba. The new policy additionally prohibits financial transactions which benefit the Cuban military’s business arm—a.k.a. Grupo de Administración Empresarial (GAESA). This is POTUS’ effort to put more money in the pockets of free and private Cuban businesses and cut the influx of cash to Raúl Castro's regime. So, U.S. travelers will have less say about where they spend their money in Cuba, as the Cuban government has control over plenty of the travel and tourist economy. This includes state-run hotels—even one of the first hotels to open on the island in decases, the Four Points by Sheraton Havana among other big brands—restaurants, and more. Renting private properties, like Airbnb rentals, will be permitted. Diplomatic relations and Obama's revocation of the "wet foot, dry foot" policy that gave Cubans preferential immigration treatment will also stand. Americans can continue to return home with their Cuban cigars. But not everyone agrees this is a smart move. Congressional Democrats and some Republicans seeking more engagement with Cuba and business-minded conservatives—the U.S. Chamber of Commerce, for example—argue this could hurt U.S. businesses and jobs. What about commercial flights, you ask? Okay, but when does all of this go into effect? Since Friday June 16, the U.S. Treasury and Commerce departments have 30 days to kick off drafting all the new rules under POTUS’ new policy. We’ve also heard “the process takes as long as it takes”. Travelers who have already scheduled a trip to Cuba can still travel as planned. ...until the new regulations take effect. Not everything is clear yet. The Treasury Department must share exactly what this means for those who book trips before the new rules, but visit the island after they are release. We will contintue to stand with the people of Cuba. None of this will stop us from sharing the “live like a local” experience with more eager travelers. If anything, it will spur us forward to continue to bring our two amazing cultures together! If you have any questions we didn’t answer here, please don’t hesitate to contact us or leave a comment below!